Have you noticed something that Vista does that is quite worrying? Or, perhaps more worrying that the other things that it does? If you click on a new location in Windows Explorer, there is, in the default configuration, an awful clicking noise that sounds like the arm in a hard drive clobbering some sort of stop inside the drive itself. Its it? Whilst we cannot be certain whether or not Vista is slowly destroying your hardware (the index building process certainly does hammer your disc drives) the most likely source of this noise is actually quite innocent. If you click on 'Start'/ 'Control Panel'/ 'Classic View' and then double-click on 'Sound' (alternatively, you can get to it via 'Appearance and Personalization'), then, in the 'Sound' dialogue box, click on the 'Sounds' tab and then, in the 'Program' list box, scroll down to 'Windows Explorer'/ 'Start Navigation' and click on it, you are in a position to cure it. In the 'Sounds' drop-down combo, 'Windows Navigation Start.wav' (with spaces in the file name) should appear. If you now click on the 'Test' button, you should be able to hear the sound that seems like your hard drive being destroyed. Why they chose this sound or how they recorded it, we don't know but you can switch it off by selecting '(None)' as the sound and clicking on the 'OK' button. We all know that telnet isn't secure but it has a lot of uses if you know what you are doing. Normally, we would use SSH for communicating with another machine's command line but there is more than that to telnet. For instance, you can change the port number that it uses so that you can check that text-based protocol using servers are running all right - examples include HTML, POP3 and SMTP. So, as telnet isn't running in the default configuration of Vista, is there any way of getting it back? Click on 'Start', 'Control Panel' and then, in the 'Classic View', click on 'Programs and Features'. In the left pane, click on 'Turn Windows features on or off', type in your root/admin password and the Windows Features dialogue box opens up. This takes ages for the box to fill - even on a fast machine. So, after a short wait, you see a listbox full of programs. Scroll down to 'Telnet client' and check the box. Click on 'OK' and then another little window opens up telling you that it might take several minutes - and it does. Now, you can use telnet from the command line just like you used to on XP. No SSH yet though - maybe on SP1. If you've tried to install Ubuntu 7.04 and had the problem that the dialogue box is too large because the screen resolution is too small - a maximum of 800x600 - you'll find that you can't get to the buttons at the bottom of the dialogue box. Pressing the [Enter] key will work to a certain extent, until it comes to having a choice - such as when you need to choose a partition to install it on. If you realise too late but you don't want to go back to the beginning again, you can still start the install but the buttons are not visible. Moving the dialogue box upwards won't work and 800x600 is the highest resolution for the VGA setting. The solution is to drag the upper and lower panels to the sides of the screen as in the screenshot. Simply press the mouse button on a clear part of the panel and drag the whole thing to the side of the screen. You can now move the panel upwards. You still won't see all of the dialogue box but you will be able to see enough of the writing on the buttons to know what they say. Even though PNG image files (Portable Network Graphics) have been around for years, it has taken that long for Internet Explorer to catch up with the rest of the world and support intermediate levels of transparency. However, the other main image file types, JPEG and GIF are still in abundance. PNG is what is called a lossless file compression format and will preserve the RGB and transparency values, pixel for pixel. However JPEG and GIF are not so which one do you choose? The answer is that they are both fairly good at their respective jobs. GIF uses a palette of up to 256 colours but has built in, an algorithm that allows it to display them perfectly. 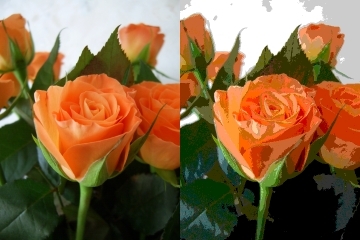 The problem with GIF is that if your image has more than 256 colours in it, your image processor has to decide which ones to throw away and that will degrade the image - look at the rose in the photograph to see what happens. Of course, if you don't use transparency and you have 256 colours or less in your image, GIF will preserve all of the image. This is all right for diagrams but you will be lucky to find a photograph that fits the bill. The problem with JPEG (files saved with '.JPG' as the extension) is that it is not very good at keeping local detail. On the right, there is a photograph of a tower crane in the middle of Derby (UK). It has a nice, steady transition from darker blue to lighter blue and some fine details in the ironwork. This is the GIF version using a standard palette (not a customised palette) and you can see that the algorithm has chosen the closest colour that is available from the palette. In the case of the blue sky, this has ended up as bands of colour - almost as though it has been posterised. By choosing a custom palette (most image processors will make you one up on the fly and it will usually be a pretty good choice of colours), you can make this look a lot better. If you have a diagram with writing on it and blocks of colour, the boundary between the background and the foreground will be poorly defined, leading to smudged writing and loss of saturation at the border of coloured blocks. Also, there is no support for transparency. Just in case you cannot see the aberrations above, here they are blown up five times. You can see how the algorithm has to make guesses to save on file size and correct for them as well, leading to the image on the right. So, if you have photographs, use JPEG compression and for diagrams, use GIF. Are your Optical mouse movements a bit jumpy? It could be your mouse mat. Optical mice are quite sensitive but they can be fooled by some surfaces - sometimes going dead, sometimes coming to life again but always on a particular piece of mat or other surface. The beauty of an optical mouse is that it doesn't really matter how many bags of crisps your children/work colleagues eat before they use it, it isn't going to stop working because of a bit of grease. In the image on the right, you can see that the underside of the mouse is quite smooth and, perhaps most importantly, there is not one of those horrid little rubber balls with the rollers that refuse to go around smoothly. Many optical mice run all right on many surfaces - but not all of them. The image on the right is of the sensor. It is only small and therefore can only see a small part of your mouse mat. If there are areas of your mouse mat where the surface is smooth and there is little pattern, then you can encounter dead spots. The trick is to make the mouse mat very even. So, try printing out the file for the mouse mat (standard size - it is just on its end so that it will fit onto a piece of A4 paper) - click on the mouse mat image on the right to open the PDF file in a new window. Cut it out and laminate it. You should find that it works just fine. Some people have noted that pathping seems to take ages to work However, there are alternatives and if you use an OS that was designed as a networking OS right from the very outset, you can get accuracies that are substantially better than 1ms. Pathping and tracert - the DOS versions of Van Jacobson's traceroute - work in pretty much the same way as each other. They both send to the destination, type eight (Echo request) ICMP (Internet Control Message Protocol) packets with a TTL (Time To Live) of one to start with. Each router that the packets go through decrements the TTL and the router where the TTL becomes zero sends back a type 11 (TTL exceeded) ICMP packet that encapsulates the header of the original packet (containing the sequence number and so on). In this way, the first router that is encountered is identified, along with the time delay of the round-trip. The program that is sending out the packets increments the TTL and sends it out again. This time, the next router sends back a type 11 ICMP packet and so on. From the results, a map is built along with the delays involved. The difference is that pathping does a more detailed analysis although times are limited to whole milliseconds because of the way that Windows works. Traceroute works slightly differently in that it sends out UDP (User Datagram Protocol) packets instead of ICMP - although the routers still send back type 11 ICMP packets when the TTL is exceeded. Traceroute's output also includes any alternative routers, along with their times. Traceroute runs on UNIX variants so its times are limited to microseconds. There is another program (UNIX-like OSes) called 'lft' (Level Four Trace). It can be made to run using ICMP (like tracert or pathping), UDP (like traceroute) or TCP. It is highly configurable and can be made to run adaptively to go through some firewalls. One thing that is worthy of consideration is the time it takes to perform the analysis. Here is a table of how long it took (figures taken from the packet stream sniffed by Ethereal/Wireshark) for a subsequent lookup (ie, this is not the first time the program was run therefore the DNS caches in the servers along the way already had the appropriate information). It must be said that judging where exploration finishes and verification starts is difficult (they seem to happen pretty much at the same time on traceroute and tracert and there is less than a second's difference with LFT) although the important figure is the total time for the program to run. One thing to remember is that if this is the first time that a particular route has been used, there may be delays whilst other machines en route perform DNS lookups. I found that this was the case with Traceroute where a later (several days) traceroute command to the same address (so the en route DNS caches did not contain the required information) took around 10 seconds and a subsequent traceroute command using the same address took less than a second. The first of these two took only around 10 seconds which is still substantially less than all of the others which were all performed as subsequent runs - ie, the figures above are what you would get on a second or subsequent run so that en route DNS caching is not an issue. For a look at screenshots of the command line output, click here and for a look at the Wireshark files, for each of the above runs, click here. QWERTY keyboards are not the only type of keyboard around. There have been a number of other layouts that have existed over the years for a number of purposes. 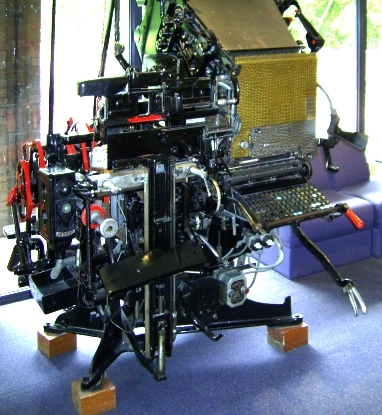 One was the Blickensderfer ('DHIATENSOR') and on the right, you can see the Linotype machine that is in the foyer of the Derby Evening Telegraph in Derby. 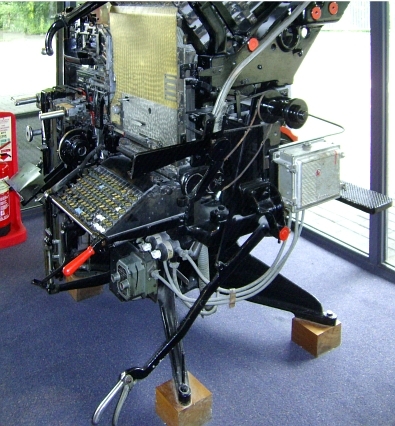 The Linotype's main purpose was to cast lines of text into little bars of metal. These were then lined up and used to produce the pages of print that the paper published (it's all done with DTP programs now). If you look at the photograph on the right, at the keyboard and then move to the left, you can see a grey coloured wheel and if you follow its spindle back, you can see a red circle. If you look up from that, you can see a red bar that is leaning just to the left in the photograph. To the right of that is a silver-coloured structure (to the right of which is a black panel). That is a pot of molten metal (or it would have been if the machine was running) around 10" in diameter. This is it from the other side. You can see at the top, at an angle of around 45 degrees, the trays with the different typefaces on and some of the wiring. Computer keyboards are entirely electric as well so there is also no reason to hang onto the QWERTY layout as this is slow. (The only reason that I can see for the QWERTY layout to prevail is that there are sufficient of them out there and there are so many established writers that use it that the manufacturers and users cannot justify setting out the required capital for the changeover.) So, how can it be improved? The Dvorak layout is a substantial improvement on the normal QWERTY keyboard layout. With a right-handed person, the left hand sits over the vowels and the right hand covers the most common letters with the last five letters in the Linotype list (KQJXZ), well out of where either hand would normally go. As a result, (if you are right handed) your least dexterous hand just does the vowels whilst your most dexterous hand dances around with the most common letters either under the home row or above it - this does lead to the common questions; 'where is the K? ', 'where is the W?' and so on. So, it's clearly a good thing to have but how do we get one? However, if you've ever tried to find new ones on the Internet, you might find that you cannot find new ones or you have to pay through the nose for them (you can get old IBM keyboards in US Dvorak layout). There is one that I am aware of that has a switch on it so that you can switch between QWERTY and Dvorak but you are probably better off making your own - if you think you can do it. This is not as bad as it might at first sound and I did it in around 30 minutes. First, catch your keyboard - this will have to be a QWERTY because Dvorak keyboards are a bit thin on the ground. However, many keyboard designs on the market will not do: you need to get one that has all of the keys on the three letter rows at the same height and angle. Reject those that have the top-letter-row keys higher and/or at a steeper angle than the middle row or the reverse for the bottom row such as the keyboard on the right. Also, the keys on all three letter rows need to be the same shape and size - this is because you are going to swap them over. The most likely candidates are cheap, flat keyboards which you can pick up for less than £10.00 such as the one on the right which I got for around £7.00. One other thing to consider is that the home keys (on a QWERTY, they are the 'F' and the 'J' keys) will not end up in their normal places. The home keys are designed to feel different so they either have a smaller radius of curvature, a raised spot in the middle or they have a little raised bar across the bottom of the key face. This last type is the best because if it is particularly annoying, you can take that off with a knife and still leave the legend on the key. Your new home keys will be 'U' and 'H'. You can prise the keys off from the front but you run a serious risk of breaking or snapping something internally if you do that. This will also increase the tendency for this to happen in normal use. It is better to take the keyboard apart carefully (remembering where each screw goes - get a piece of paper and draw a map of the screw locations on it then, as you take them out, push the screws into the paper so that when it comes to putting them back, you know where each one goes). With the back off, you will probably be met with either a single sheet of rubber with conductive pads or, with a lot of separate silicone cones. With the silicone cones, make a note of the position of any different ones (such as colour-coded cones for the Enter or Shift keys) and put them to one side. With this type, you have two printed circuit boards but instead of board, they are printed on thin, plastic sheet. Between these two sheets is another, but this time with holes that correspond to the key positions. In this case, the two printed circuits come into contact when the key is pressed, forcing them together with the silicone cone, through the hole in the middle sheet. Put these to one side if you can (or, if you cannot safely remove the printed circuits, just make sure you look after them whilst you do the next operation). Next, you need to take out the keys. The keys usually travel in a cylinder with the key pad expended on top. They can be hold in by a catch and if you examine the underside of the key - where it comes through the panel, into the back, you might be able to see a latch of some sort. You can probably unlatch this with a screwdriver or similar instrument but be careful not to damage it. Once you have, swapping them so that they end up in the order in the photograph - only the 'A', 'M', '\', back-tick and the numbers don't move - screw back the top again and you have your keyboard. Just in case you were interested, there are other versions of Dvorak keyboard: a design for use only with the left hand, one for use only with the right hand and, the US design. The UK designs keep the double quotes above the '2' and the '@' goes where the 'Q' on a QWERTY keyboard goes so that in our world of electronic mail, the most used key is within easy access (if we wanted to stretch to get it, we would have used a QWERTY keyboard layout, now, wouldn't we?). 'QWERTY' is not the only keyboard arrangement supported by PCs and whilst you might not expect to find or a Linotype ('ETAION SHRDLU') layout, you should expect to find an English Dvorak. On SuSE Linux, open YaST 'Control Centre' (this is the personal settings and not the administrator settings) and under 'Regional and Accessibility', choose 'Keyboard Layout'. Under the 'Layout' tab, select the country layout you want and then add to the active layouts, choosing 'dvorak' as one and 'basic' as the other. In the panel, you should now get a little Union Jack with 'gbd' or 'gb' in it. Click on it to change the global layout. If you want to change the layout on a more global scale, open YaST 'Control Centre'/ 'Hardware'/ 'Keyboard' and under 'Layout' you have two configurations. Under the primary set-up, change the variant to 'Dvorak'. You can check that the letters match by using the test box at the bottom. This is just what it says it is - United Kingdom Dvorak. Click 'OK', then 'Save' then 'Exit Sax2'. On Windows Vista, click on 'Start'/ 'Control Panel'/ 'Classic View' then double-click on 'Regional and Language Options'. On the 'Keyboards and Languages' tab, click on the 'Change Keyboards...' button. In the 'Text Services and Input Languages' dialogue, under the 'General' tab, click on the 'Add...' button, go down the list and under 'English (United Kingdom)'/ 'Keyboard', check the 'United States-Dvorak' box - there is no other choice at the moment. If you click the 'Preview button, you can see that the double quotes, '@', '£' and '#' keys are in different places or non-existent and that the tilde ('~') is a shifted back-tick. To get a '£', hold down [Alt] and use the number pad to key in . When you release the [Alt] key, the character will be displayed. The bogomips value can be an invaluable measure of just how fast your computer is (although this is a measure of floating point maths in the integer part of the kernel so it is just about as meaningless as any other performance value on any system - doesn't stop it being an indicator of speed though, you just have to realise that it is no more meaningful than any other value). So, if your rig has an AMD 3700+ processor but when you click on on 'Menu', 'System', 'Monitor', 'KInfoCenter' and then on 'Processor', although it says that it is an AMD Athlon 64 ... 3700+, it also says the bogomips value is only 2,010.94. The 'Processor' page in KInfo Center is predominantly the output of 'cat /proc/cpuinfo'. The bogomips figure is calculated during the boot process and stored along with the rest of the information in '/proc/cpuinfo'. The Athlon64 3700+ we used here runs normally at 1,000MHz but scales up to a maximum of 2,210MHz when it is needed. The figure you see on your computer could well be the one that was calculated at 1,000MHz which is what the Linux Kernel now does. If you run a recent version of KNOPPIX (such as 5.1.1) and look at '/proc/cpuinfo', you will see that the CPU speed is reported as 1,000MHz which gives 2,010.94 bogomips. Using an earlier version of KNOPPIX such as 4.0.2 (where the CPU speed is full during the bogomips calculation), looking at '/proc/cpuinfo' shows a CPU speed of 2,209.868MHz and 4,358.14 bogomips. Mystery solved. Liquid nitrogen cooling produces performance gains but you also need to consider the hazards. So, if you want to replace the dust collector on the right with something out of a Frankenstein film, do so by all means but put safety first. In articles about liquid nitrogen cooled computers, the only protective equipment a lot of the people in the photographs seem to be wearing are goggles and gloves. As somebody who has worked in a laboratory, I am utterly appalled by this as they appear to be putting across the message that goggles and gloves are safe enough and, the only protection and precautions required. It is more dangerous than that. Liquid nitrogen ('LN', boiling point -196C) is actually very dangerous and goggles and gloves are not enough. Nitrogen is roughly 78 per cent of the air we breathe - the remainder being mainly 21 per cent oxygen and one per cent argon. The level of oxygen is quite important. above 25 per cent and fires become difficult to put out. When the LN has boiled down a long way, you might see that the liquid has turned blue. This is liquid oxygen (LOX) which has condensed out. LOX is also extremely dangerous, pushing the air oxygen level above 25 per cent, making fires difficult to put out. 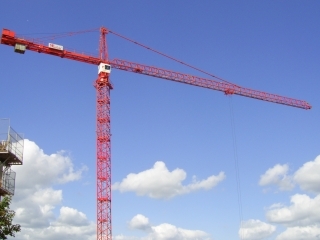 Oxygen can saturate fabrics and build up in confined spaces. So, if you read up further on the issues and take appropriate precautions, you might be able to do this reasonably safely. One problem that a lot of LN cooled systems have is that they attract frost. This is caused by the air being cooled below its 'dew-point'. The dew-point is a temperature below which water will condense out from the air - in other words, when the relative humidity goes above 100 per cent. To stop this from happening, you need to have the circuit board and anything else that gets cold, surrounded in air that has a low dewpoint - one that is lower than the temperature of the equipment. So, rather than trying to get dry air from somewhere, you can use the evaporated LN as a source of dry air. If you have your computer in a case of some sort, just let the nitrogen from the CPU LN cooler purge the case and without water vapour in there, you shouldn't get any frost formation. if you've played around with your Linux computer, you might have noticed that in Grub, there is a kernel option; 'elevator=cfq' and wondered what it is. Well, the elevator is a system-wide setting for the In/Out scheduler, affecting all of the disc drives. When your system boots, it uses the default scheduler (usually cfq) unless you have specified otherwise. This is done in the grub menu and seen as a boot option. CFQ ('cfq') stands for 'Completely Fair Queuing' and it is not the only option. There is also: 'Anticipatory' ('as'); 'NOOP' ('noop'); and, 'Deadline' ('deadline'). They differ in the way that they work. Basically, CFQ maintains a scalable I/O queue for each process and tries to distribute the available bandwidth equally amongst all of the I/O requests. This produces good results where you have multi-processor systems and where you have many LUNs (Logical Unit Numbers - channels/drives/partitions/slices) as part of a system such as a storage area. Both queries and transactions perform well with CFQ. The deadline scheduler minimizes the latency for any given request using a round-robin algorithm, visiting 5 queues and producing close to real-time performance with processes being seen to quickly. It re-orders requests and whilst it's transaction rate is slightly lower, it is faster at queries than CFQ making it a better option if your system is preoccupied with database queries. NOOP uses a simple FIFO (First In: First Out) queue and as a result is substantially lighter on CPU time - assuming that the disc controller or the host adapter will sort out anything else that needs doing. NOOP runs at about 75 per cent of CFQ's speed so if you need to run something that is processor intensive, you can use NOOP and let the controller do the processing. Anticipatory adds a short delay so that it can collect and sort I/O requests and as a result, reduce the seek operations required on the drive itself. The problem with this is that it increases latency but it excels in environments with a limited number of LUNs and slow drives. Most home systems use only a few LUNs so this one is worth a go. The best way to find out which one works best for you is to try them all and benchmark them under normal use. This will not affect what is written to your drive so it is safe to play around with. add it to the kernel options when you boot up in Grub. 'elevator=as' should work all right on home systems so give it a try. You might be quite happy with your digital camera on the whole but you could find some interesting and unwanted effects if you have areas of saturated red or blue, next to some other colour, resulting in a 'blocky' appearance. The image on the right is of a Cinnabar moth. As the name suggests, it has brilliant red areas on its wings. The image is 33 per cent of its normal size so one pixel here, represents 3 pixels on the original. This is part of the above picture, blown up to three times its size so three pixels here represent one pixel on the original. You can see that the detail appears to be fairly consistent as the light grey lines travel across the darker colours of the wing. However, where the border is between red and the darker grey, the level of detail is half of that - giving it the blocky appearance. 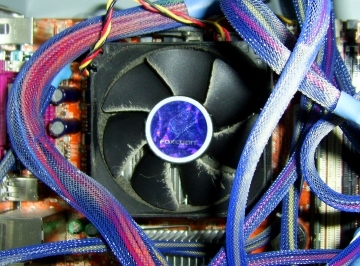 This is an image of a computer that appeared at the Computer Trade Show in May 2006. The 'R's of 'CORSAIR' definitely have a clipped appearance about them. And here, you can see just how clipped - you can also see that the pure red only has half the detail again. So, what's going on? The image sensors in your digital camera are sensitive from blue right down to red (and beyond, into the infra-red range) and therefore are not capable of differentiating between colours. To get over this, the sensor manufacturers use filters so that a given cell will be sensitive to red, green or blue - corresponding to the primary colours that our eyes use. A cell can only detect one colour so they have to be placed next to each other - a demosaicing algorithm being used to guess the levels of the two missing colours so that the cell can form a three-colour pixel. A hexagon- or triangle-based pattern would be best for fitting the colours on the sensor but unfortunately, colour monitors and every image processing/handling software and hardware component down the line uses a rectangular raster. To get over this, each 2x2 sub-square of the layout of the cells has the three primary colours and the fourth cell is used for an additional green - the Bayer filter mosaic. Our eyes are more sensitive to green so having twice as many of these than the other colours allows for more detail in the final image. Whilst green is all right for detail, the red and blue are impoverished and you can see in the images on the right that every other row/column doesn't have either a red or a blue. This has the unfortunate effect that where you have a narrow, saturated red or blue detail that crosses one of these blind rows/columns, there is nothing there to form a guess with. In the photograph, you can see how the Bayer mask overlays the memory card displays and that the bottom of the 'C' in 'CORSAIR' on the display falls in one of these blind spots. Unfortunately, you are stuck with this and even using a RAW image will only give you the same information. The solution is to use a camera with a completely different type of sensor - one that uses a trichroic beam splitter and three different sensors so that three cells (red, green and blue) map onto each other leaving no blind spots for thin lines to disappear into. But first, you've got to find one. Your camera's image is captured by the cells on the CCD sensor. This works because of something called the photoelectric effect - where electrons are displaced by individual photons. So, in effect, the output of each cell is a crude count of electrons and has a very large dynamic range, although this is reduced quite substantially by thermal noise which also messes around with the electrons. Normally, this is reduced down to eight bits so that the image can be saved as a JPEG file but if your camera can save RAW files, you can keep a lot of this dynamic range. The result of this is that if you were interested in a range of detail that only existed in the darkest one per cent of the image density, a JPEG image (being 8-bit) would give you two or three values to choose from whereas you might well find that you could extract a whole eight-bits-worth of data from that range using RAW. Another advantage of cutting down the dynamic range to 8-bit is that you are able to perform corrections to: colour temperature; linearity; gamma; saturation; and, so on - at the end of this, you still have an 8-bit per pixel per colour image and haven't introduce any JPEG artefacts. Here is the White balance tab. You can select the level of green you need to have, along with the colour temperature. If you click on the dropdown combo, you can see a number of different white balance choices. The colour tab allows you to choose an input profile and an output profile, changing the gamma and linearity in the process. Notice the file icons on the right hand side. You can load or save curves and other settings as you go so if you encounter these conditions again, you can just call them up when you need them. Here, we have the interpolation algorithms to use. AHD should do for most operations but you can choose any you like. In the column on the left, at the bottom, there are a couple of buttons and check boxes: for under- and over-exposed pixels. Clicking and holding down the buttons will show you which channels are over exposed and where on the image; whereas checking the checkboxes will mark the under exposed as black pixels and the over exposed as white pixels. So, whilst RAW files are normally at least twice the size of a corresponding JPEG, the amount of extra data you have to play around with makes it all worthwhile because you can look at sections of the image that are usually destroyed by the process that makes the JPEG image for you.